is the author of a memoir, Flunk. Start. (Counterpoint); the novel Catching Heaven (Ballantine), a Penguin/Random House Reader’s Circle Selection and a Willa Award Finalist for Best Contemporary Fiction; and a book of writing essays and exercises, Tools of the Writer’s Craft (Moving Finger). Her plays include an adaptation of Louisa May Alcott’s Little Women, which recently enjoyed its tenth production, and the comic/drama Fair Use, which explores the “was it plagiarism?” controversy surrounding Wallace Stegner’s novel, Angle of Repose. Sands is also a singer/songwriter; she recently produced her first CD, Rustler’s Moon, and performs widely. Also a theatre artist, her directing experience runs the gamut from Shakespeare to Giradoux to new works by new playwrights, and she has an extensive acting resume. A popular teacher, she leads workshops and lectures for such conferences as the Community of Writers at Squaw Valley and the Iowa Summer Writing Festival. Sands is currently an Associate Teaching Professor of English and Creative Writing at Franklin & Marshall College, in Lancaster, PA, where she is also the editor of the F&M Alumni Arts Review. She lives in the foothills of California’s Sierra Nevada. Sands’s recent performances include her fifth annual Holiday concert, at the charming gallery, It’s Modern Art, in Lancaster, Pennsylvania; the twelfth annual Night of Giving, a community event that benefits the Nevada County homeless shelter Hospitality House produced annually in Nevada City’s Miners Foundry; and HEART SLAM, a spoken word and song event at The Open Book in Grass Valley, California. In addition to her memoir, Flunk. 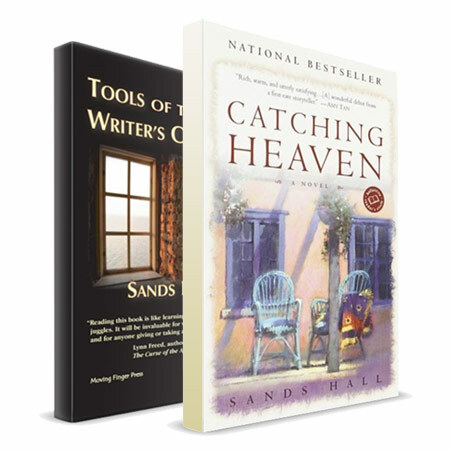 Start, Sands Hall is the author of the novel, Catching Heaven, and a book of writing essays and exercises, Tools of the Writers Craft. Her stories have been published in such journals as the Iowa Review and New England Review. Sands Hall is a playwright, director, and actor. Her play, Fair Use, explores the controversy surrounding Wallace Stegner’s use of the life and writing of nineteenth century writer and illustrator Mary Hallock Foote in his Pulitzer Prize-winning novel, Angle of Repose. Sands’s experience as a playwright, director, and actor gives her a unique perspective as a teacher of writing. Each summer, she teaches for the Iowa Summer Writing Festival and the Community of Writers at Squaw Valley. She is currently an Associate Teaching Professor of English and creative writing at Franklin & Marshall College in Lancaster, PA.